Half day (3,5 hours) four participants: 85 Euros pp. Child (5 to 10) on the back seat 40 Euros. Half day two participants: 95 Euros pp. Full day (7 hours) with lunch 4 participants: 150 Euros pp. Child (5 to 10) on the back seat 50 Euros. Full day with lunch 2 participants: 165 Euros pp. 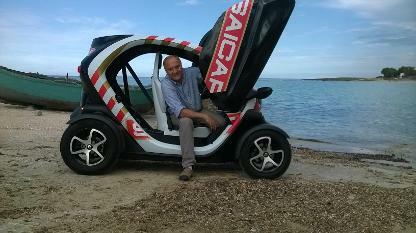 Your guided adventure will take you on the Adriatic coast of Ostuni in electric 2-seater Twizys, which you can drive yourself. We will take you along the country road built by the Roman emperor Trajan among medieval farms (masserias) and centuries old olive groves in the charming Ostuni's countryside. A valid driving license is required. Should you prefer to share one Twizy, the rear seat can accommodate an average adult or a child with child seat. The half day 3,5 hour guided tour begins in Ostuni and then will proceed north along the coast. The sustainable, eco-friendly, semi-open electric Twizys are in keeping with Green Italy’s commitment to the conservation of the environment. The fun factor is guaranteed by the go-cart like driving and acceleration experience. 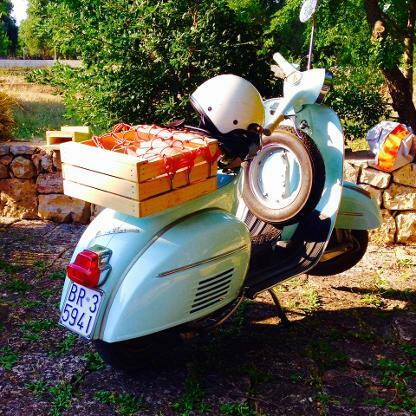 The same program may be done on modern or vintage Vespas. 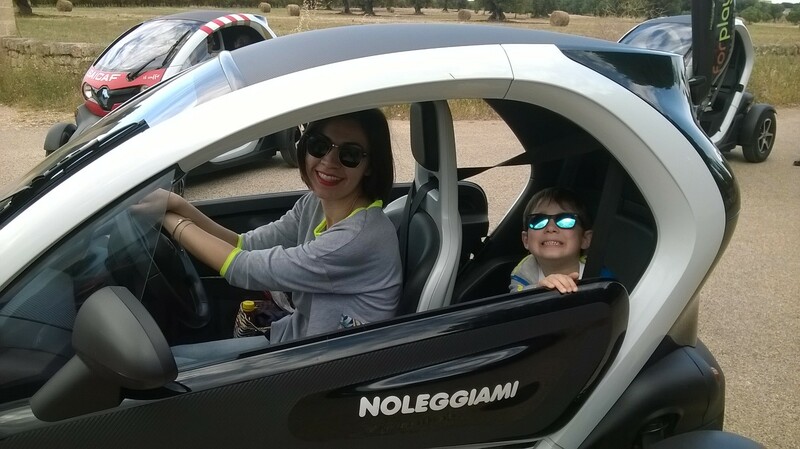 If you prefer a full day Twizy Tour we will drive our Twizys further down to the coast (15 km) toward Torre Canne, enjoy fantastic views and have lunch by the sea (You may also enjoy a quick swim if you like). Who would not want to swim or just sit and relax in a cozy beach bar, enjoying delicious food and cocktails? The full day tour includes a stop at one of our white sandy beaches with shallow turquoise waters. Enjoy the sun and water while soaking in the local ambience.